One of the biggest problems with driving a Tiger is idiots who come up behind you and decide to tailgate. Not that the Tiger encourages them as they are stupid enough to do it to everyone else but.... The Tigers rear lamps are low to the ground and hence if a van driver gets too close they won't see the brake lights come on. Now with the performance of my brakes that could be an issue so I decided to get a high-level brake unit. This was picked up from Car Builder Solutions for an outrageous Â£8.50 (how do they make a profit?) and is the unit featured here. All I had to do was fit it. Fitting was not as simple as expected. 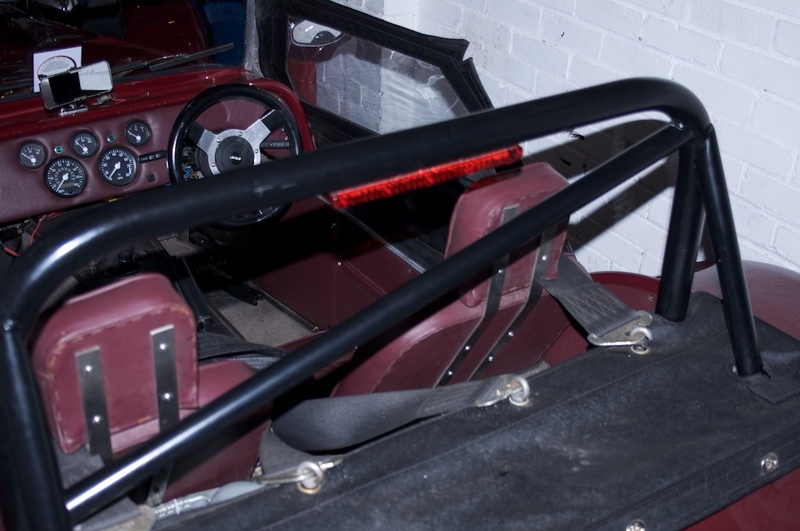 The only way to do it properly was to hide the electrical cable inside the roll bar. To do this required a bit of planning (and asking Malc Brown how he did it on his car). Next the rollbar was removed from the car and a second (larger hole drilled in the bottom of one of the legs, followed by a coresponding hole in the chassis to allow the cables to pass. Now the fiddly bit. With a length of fishing line and some weights feed the line through the top hole and out of the hole in the bottom of the leg. Attach the line to the wires for the brake lamp and draw them through the rollbar. Refit the rollbar loosely (i.e. don't tighten up the bolts) and feed the wiring through the chassis rail carefully taking up most of the slack but leaving about 6" of slack to be lost in the rollbar in case of future work. Tighten the roll bar and attach the light to the underside of the bar with numberplate fixing tape (thanks to Niall Turner for that suggestion) also remove the two mounting tags from the back as they aren't required. 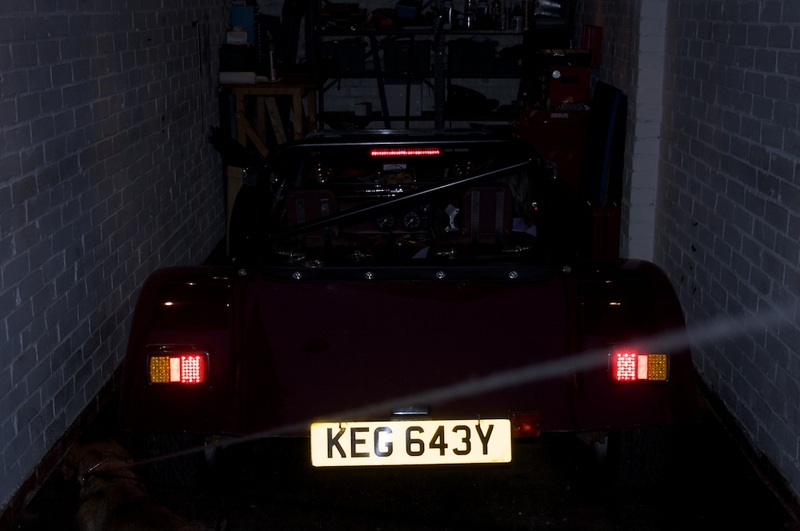 The only job left is the wiring - rather than splice into the main wires for the car I elected to run the connection from the brake lamp switch so that I have two seperate routes for brake lights.